If your polished marble floor has lost its shine and luster due to high-traffic, use, and abuse, it can be revitalized to its original, beautiful state. If your marble countertops are scratched because someone forgot to use a cutting board or stained and etched from sauces and acidic foods, Elite Stone and Tile Care can restore them to like new. If your limestone shower walls have become chipped or damaged because of improper cleaners or your marble vanity is damaged from cosmetic products… you guessed it — we are natural stone experts who can resolve virtually any problem you encounter with marble and limestone. 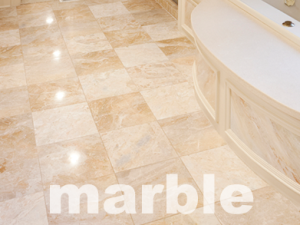 We can hone and polish your marble to reveal the brand new surface that lies beneath. Elite Stone & Tile Care serves the Orlando, Daytona and Melbourne areas in Central Florida and can repair, refinish, protect, and restore your natural stone. Whether you have honed marble walls, limestone floors with a matte finish, or highly polished marble surfaces, all natural stone types need professional care and maintenance. Marble and limestone floors and surfaces will retain their beautiful shine if they are periodically cleaned and re-sealed. Elite Stone and Tile Care can perform these services for you. Marble and limestone are generally softer stones that come in many colors with beautiful, unique veining. Some types of marble and limestone are harder than others, and consequently, they can become scratched, etched and lose shine and luster, especially in high-traffic areas. Sweep or dust mop your marble and limestone floors regularly to remove any debris that can get ground into the surface. Marble and limestone are very sensitive to acidic chemicals, so it is very important to keep any marble surface out of contact with acidic materials. Use only recommended cleaning products. We offer a full line of stone-safe care products so that your floors and surfaces can look great all the time. We make it a point to educate our customers on proper stone care. Contact us online or call (407) 567-7660 for a FREE estimate on marble and limestone polishing and restoration services throughout the Orlando, Daytona, and Melbourne areas.